The essential tool kit for sparkling wheels and well-dressed tires. It’s never been easier to clean wheels and dress tires to perfection! The Speed Master Wheel Brush Bundle includes three of our most useful and versatile wheel cleaning tools: the Speed Master Wheel Brush, two Flex Foam Finger Pockets, and three Flex Foam Tire Applicators. With this special bundle, you’ll have the clean, sharp tires and wheels that complement your entire vehicle. This advanced wheel brush has everything you want in a quality detail brush and much more. The Speed Master Wheel Brush has a thicker, reinforced stem. It maintains its flexibility but the new stem is more rugged for frequent use on auto wheels. The bristles are slightly feathered on the ends to gently clean delicate wheel finishes, such as coated or plated wheels, without scratching. In addition, the patented memory bristles regain their shape after each use. Just rinse them in hot water and hang the brush to dry. The soft Nylex bristles will not scratch any wheel, and they’re chemical resistant. The Speed Master Wheel Brush fits into spaces ½ inch wide and the stem bends to clean around spokes. The brush stem and tip are covered in vinyl to protect the wheel from scratching. No wheel design is too intricate for the Speed Master Wheel Brush! Flex Foam Tire Dressing Applicators are made of a unique foam composition that conforms to the curve of your tires’ sidewalls. Foam applicators that are precut into a curve might not match the curvature of your vehicle’s particular tires. 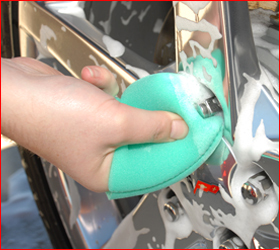 Flex Foam Tire Dressing Applicators flex to hug the rubber and apply a neat, even layer of tire dressing. After your wheels are cleaned and dry, use a Flex Foam Tire Applicator to apply a neat layer of your favorite dressing, such as Pinnacle Black Onyx Tire Gel. 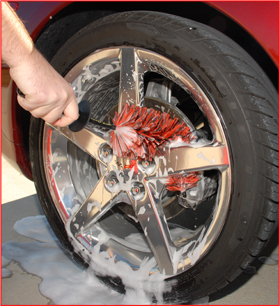 The Speed Master Wheel Brush is ideal for cleaning spoke wheels, grills, and even in the engine compartment. You’ll wonder how you ever detailed without it! Get clean, expertly detailed wheels and tires with the Speed Master Wheel Brush Bundle, available at an excellent savings off the regular retail value. A total retail value of $51.64, you save $11.65!